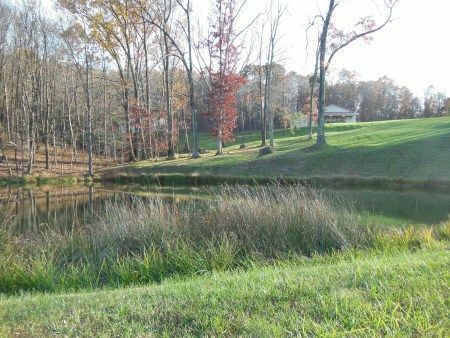 Turn this extremely well kept property into your home or go hunting, meander the wooded acreage or cast your favorite lure & enjoy your evenings fishing for Large Mouth Bass in the stocked, beautifully situated pond and turn this into your private week-end retreat! Apx. 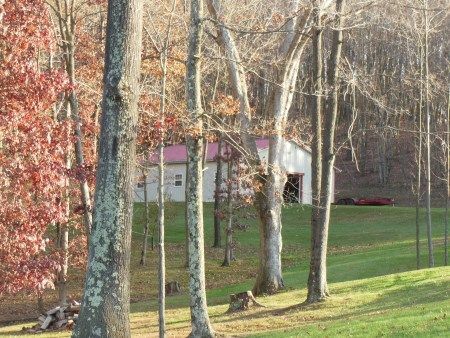 10.96 Acres and neighbor the State of Ohio land to hunt and fish. You will even find the fenced-in garden area that keeps the Whitetail Deer, Turkey, Squirrel and Cotton Tail Rabbits out of your fresh grown vegetables. The ppx. 36’ by 40’ Home & 2 Car Attached Garage has overhead doors with door openers; home offers Bedroom with large closet; Full Bath with Shower; Eat-In Kitchen with center island, built in stove top, oven and microwave; Hall Utility Area with Washer/Dryer hookups; Spacious Living Room; (2) Utility Closets. Home has beautiful Cherry Trim, and is equipped with Ross County Water, Electric Furnace with Heat Pump and Central A/C, Electric Hot Water Tank, Security System and (2) 100 Amp Breaker Boxes. Pole Barn: The metal sided and roof barn is Apx. 36’ by 40’ with overhead door apx. 10 ft. wide & 8 ft. tall, entry door, security system, electric, lights, outlets, built-in wall shelving, insulated ceiling/sides and concrete floor. This beautifully located home has so much to offer! Come take a look!!! This could be the one you have been looking long & hard for! Kubota BX22 Tractor, 4-WD, Diesel, with Loader attachment apx. 48 inch bucket, BT600 Backhoe attachment, apx. 2002 model and apx. 715 hours showing, Super Clean Tractor would be very handy. Bobcat Pro Cat Zero Turn Mower 22 HP Kawasaki, Apx. 52” deck, showing apx. 420 hours. Troy Bilt 42” Super Bronco Lawn Tractor with mower deck. Tandem Axel Trailer, bumper pull, apx. 16 ft. long, apx. 6 ½ ft. wide. King Kutter II Tiller, 3 Pt. Attachment, PTO driven, apx. 4 ft. wide. Craftsman Table Saw 3 HP; Bolts; Chain Driven Roto Tiller 5 HP Brigg & Stratton; WHIPPER Walk Behind brush trimmer 8 HP Briggs & Stratton; Aluminum Extension Ladder; Pull behind grass seeder; HUSKEE HD Lawn Sweep; Craftsman Shop Vac; Craftsman 3 HP 20 Gallon Air Compressor; Generator GEN POWER II pull start gasoline; 6” Jointer floor model; Work Bench Steel Top; Metal Shelving units; Bench top drill press 1/3 HP; Gas Cans; 10” Mitre/Cut Off Saw; Step Ladder; Pull Behind Lawn Roller; Cement (Hand Tools); Clamps; Wheel Barrow; Yard Hand Tools; Steel T-Posts. Aluminum apx. 10 ft. flat bottom John Boat; Trolling Motor; Cherry Lumber boards; Trapping Supplies; Canning Supplies; Whirlpool Dehumidifier; Haier Mini Fridge; Oil Lamp; Coolers; Lounge Chairs; Tiki Torches & more. Real Estate Terms: Min. Bid $50,000. ; $8,000. Down at time of sale cash/check with photo ID; Offered free & clear prior to closing on or before May 25th 2015; at closing; taxes prorated to closing date; No Buyer’s Contingencies Exist; Sold in present As-Is condition. Personal Property Terms: Absolute Auction on Personal Property only, No minimums No reserves; cash/check with photo ID; Sold As-Is; No warranties or guarantees expressed, given or implied; All sales final; payment in full prior to removal. Taxes & Legal: Ross Co. Auditor reports net annual tax: $978.66; Parcel No. 340606142000; Vol. 562, Pg. 0778.